ART for the Masses, ART for the People. : Overhead Nik, April 2011, HS. by Glasgow Cowboy: Current and Past Work Jan 2008 onwards. Overhead Nik, April 2011, HS. 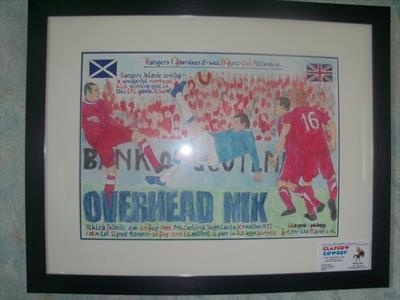 Rangers Nikica Jelavic scoring a wonderful overhead kick goal against Aberdeen at Pittordrie (1-o). Fourteenth goal in 20 appearances. ART For The Masses ART For The People. This work is my very first water colour and I am pleased with it.